Promotion for hot tubs has been given a major boost thanks to The Hot Tub and Swim Spa Company helping to supply a Hydropool hot tub for a special feature on ITV’s ‘This Morning’ show. Specialist Hydropool dealership The Hot Tub and Swim Spa Company has been a driving force for the UK success of the hot tub and swim spa brand, which gained a WhatSpa? Best Buy Award for the 670 Platinum model in the 2017 edition of the consumer magazine, and ensured a 790 model was in prime spotlight today as part of ‘The Hottest Hot Tubs’ section of the programme presented by Eamonn Holmes OBE and his wife Ruth Langsford, with the help of Alison Hammond, during the end of the week edition of ‘This Morning’. The eight-seater Self-Cleaning Hydropool 790 model from the Platinum Series, which comes in at 238cm x 238cm x 99cm and has been dubbed the ‘Honeymooner Special’ as its design incorporates two side-by-side never-float loungers and an additional lounger that faces a separate direction, was featured in the special ‘our guide to the best hot tubs’ segment. It is among The Hot Tub and Swim Spa Company’s large selection of hot tubs and swim spas at the imposing site at the Ruxley Manor Garden Centre in Sidcup, Kent. 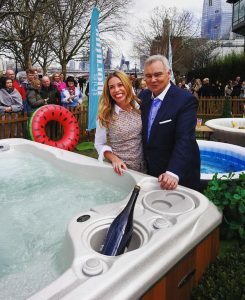 After filming was completed on London’s SouthBank, which also included promotion of Intex and Lay-Z-Spa inflatable designs, The Hot Tub and Swim Spa Managing Director Christina Clarke, pictured with Eamonn next to the 790, revealed that Eamonn was impressed by the Hydropool hot tub; and Alison was so captivated by the power of hydrotherapy from the 790 that she has vowed to purchase one for her own use. “Eamonn loved our Hydropool Self Cleaning hot tub and Alison has promised to buy one,” divulged Christina. Every year the award-winning WhatSpa? Approved retailer has increased its status as a main dealership for the Hydropool brand, which has now become part of the Jacuzzi-owned group of wet leisure brands, and achieved record sales last year to coincide with being bestowed with the ‘Hydropool European Retailer of the Year 2017’ accolade. “We had record sales last year and we’re feeling very positive about this year as well,” Christina reported to HTR.